If you thought the women’s “ekiden” road race that took place in Fukushima City last year was bad, you haven’t seen this thing. Minami Soma City, where one of the “black dusts” found on the road surfaces throughout the city has 3.43 million becquerels/kg of radioactive cesium (and who knows what else), will hold a marathon and “ekiden” road race in the city to show to the world the recovery and reconstruction of Minami Soma City. Unlike the women’s road race in Fukushima City where the youngest girls who could enter the race were 13-year olds, the Minami Soma marathon event will have elementary school kids running the 2-kilometer course. Now that’s very interesting. That telephone number is a Tokyo number, not Minami Soma. The NPO’s announcement shows it is located in Shinjuku-ku, Tokyo. The chairman of the Council is Nobuyoshi Sato. No idea who this man is, but he has successfully obtained the government money (who will then take money from the taxpayers) to plan an event where elementary school children are encouraged to run in a city with on-going “decontamination” effort right outside the 20-kilometer no-entry zone in Fukushima. 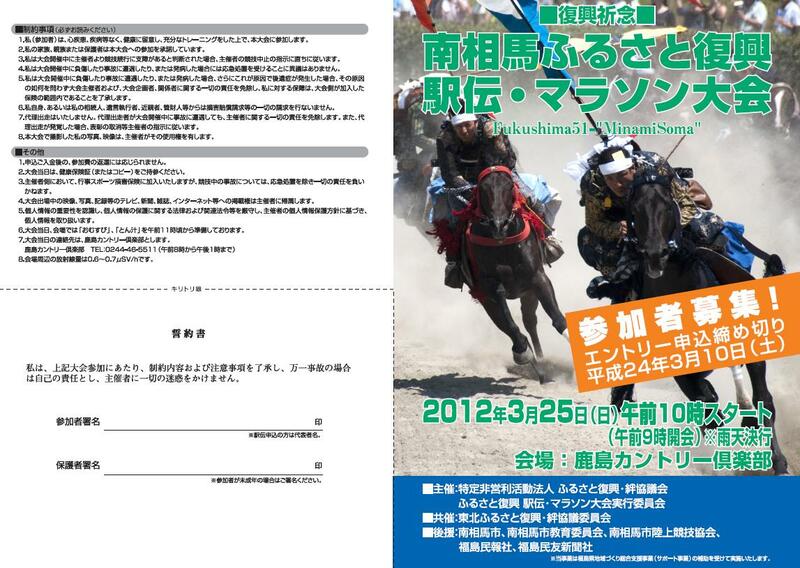 The event subtitle is “Fukushima-51”. It will send vigor and courage for the next millennium with courageous dream from Kashima Country Club. Fukushima-50 (whom the world praised) plus 1. “1” signifies the future of courageous children, region, and Japan, and by broadcasting the event to the entire world showing the local people running toward the recovery, we will thank people from all over the world who have helped us. It will evoke the image of powerful and proud Japan, and will inspire courage and confidence in the recovery of the region. So we will hold this event. By the way, the parents of these children (under the age of 18) must sign the waiver for them that will indemnify the organizer from any injury and sickness on the day of the event and afterwards. If you see school kids running in this event, there are parents in that city who will have signed the waiver. So much for “We have to protect children” refrain you hear all over Japan. HCR+OPCOM, a Minami-Soma-based NGO who protested the Fukushima City’s women’s road race, was doing a hunger strike in front of the Kajima Country Club protesting against the event that would endanger children for no good reason other than to show that people in Minami Soma are brave.